Gemini Decorators & Property Maintenance - Builder, Fencing/Gates, Hire Services, Painter/Decorator, Rubbish/Waste/Clearance , Tiler - Tiling based in Farlington, Hampshire. With over 34 years' experience in the Painting & Decorating Trade and Property Maintenance Industry. [email protected] are the preferred contractors for various Building Firms and Estate Agents in and around the Portsmouth, Hampshire, Sussex and London areas, and come highly recommended. We offer an additional service with a manned cherry-picker machine. The beauty of this machine is that it is incredibly quiet and negates the use of scaffolding which is ideal if you have an event staged nearby. (Npors EUSR licenced). 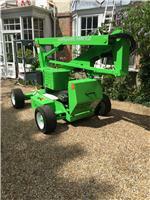 We now have the HR12 Niftylift Cherry Picker which is Simple, reliable & easy to maintain and idle for factory's . Available to hire today.